Aroma of our "Ocean Breeze" Incense Stick is soothing just like like the first breeze of the spring that which carries the sensuous smell of ocean. Being an exception combination of flowers, this range of Incense Stick releases a smell that mesmerizes all. We prepare our range of Ocean Breeze Incense with high grade combustible material dipped in scent of flowers, herbs, essential oils, and many other biotic materials. When burnt, Incense Stick releases fragrance with smoke which brings peace to mind and soothes the nerves. Its fragrance will captivate your senses and evokes your meditative mind to focus during prayers and chants. 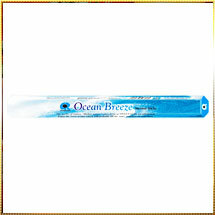 Variety of sizes are available with us in our range Ocean Breeze Incense Stick. Also, we ensure air sealed packaging to lock the fragrance for ever.